What kind of kitchens do millennials favour? Love it or loathe it, millennials make up a significant number of the population. They help shape trends, they introduce new ideas and they are among some of the world's most innovative beings. They also have their own set of likes and dislikes, which has driven fashion, technology, music and home decor. Whether you are a millennial looking to outfit your first kitchen, or a parent trying to understand your offspring's generation (and perhaps want to update your kitchen decor) here are some trends and kitchen renovation ideas for the young as well as the young at heart. Houzz's 2017 U.S. Kitchen Trends Study noted that millennials tend to prefer farmhouse-style or modern kitchens. 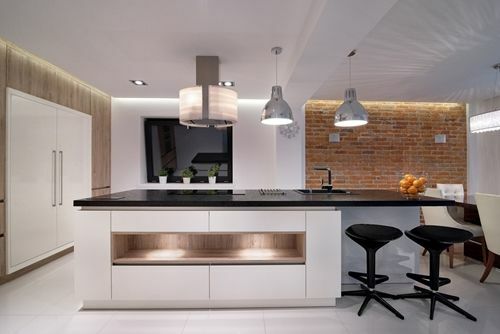 By modern, Houzz meant kitchen decor with a contemporary feel, namely in shades of white and grey. Looking to update your kitchen? Try a white kitchen countertop matched with grey kitchen cabinets. The sleek, futuristic appearance will put you on trend, also contributing to a minimal, clean feel in your space. For ideas on what materials to select for your kitchen countertops and cabinets, visit a kitchen and bath showroom to chat with professionals who can work with your budget and your desires. Stainless steel is the preferred finish for appliances in millennial homes; it matches the contemporary vibe. The source also noted that 72 percent of those surveyed would opt for this material. When considering new kitchen fixtures and faucets, you can match your appliances by opting for a brushed metal finish. Millennials have some kitchen and home decor ideas of their own. Millennial kitchens tend to center around the kitchen island. It's a gathering spot, place to enjoy happy hour and breakfast, and a multipurpose space that can help the kitchen feel larger. Home Building and Remodeling Experts stated that this generation appreciates the ability to entertain in the kitchen as well as the increased counter space and storage – a must in smaller homes and apartments. Individuals may also want to add electrical outlets or use the space for addition in-kitchen seating, if possible. This generation which has experienced and embraced many different kinds of technology enjoy unique home features. USA Today featured a kitchen designed by millennials and intended for them to use, which was based upon the results of a German survey querying 18 to 29 year-olds. The biggest takeaway is that millennials like useful accoutrements that can be hidden away. For example, a drawer underneath kitchen cabinets pulls out and has space for pet food and water. Inside another door hides a cereal dispenser. And the kitchen island design has baskets for food storage in addition to a hidden compost machine. Your kitchen remodeling project can have such features, as long as you account for the extra space or the extra cabinets required. A cereal dispenser may seem overboard to some, but a classy, grey and white kitchen may give the room a contemporary boost. Any kitchen renovation will be a fun project, and maybe you can modernize it, just a little, in the process.